If one were to look at the India-China relationship, apart from territorial disputes, one of the major bones of contention between both countries has been Beijing’s close ties with Pakistan. The China Pakistan Economic Corridor (CPEC) passes through disputed territory and New Delhi has put forward its reservations on more than one occasion. This was one of the main reasons why India boycotted the One Belt One Road Summit held in China in May 2017. However, Beijing has turned a blind eye to the activities of Pakistani terror groups which have targeted India and it is China’s support for Pakistan, which has ensured that Jaish-E-Mohammad (JeM) Chief Masood Azhar has not been declared a ‘terrorist’ at the United Nations, and it has blocked US moves in such a direction, more than once. Only recently, the US has declared MML (The Milli Muslim League), a political party formed by Hafiz Saeed (who heads LeT Lashkar-e-Taiba (LeT) and Jama’at-ud-Da’wah (JuD), as one of the fronts of LeT. Its top officials have also been designated as specially designated global terrorists. The Tehreek-e-Azadi-e Kashmir has also been declared as a terrorist organization by the US. It is not just the China-Pakistan nexus in the context of CPEC, or Beijing’s tendency to turn a blind eye to terror groups operating from Pakistan which should worry India. Through its economic leverage in South Asia, China is doing its hardest to ensure that Pakistan remains relevant in the SAARC region. Recent visits of the Pakistani PM, Shahid Khaqan Abbasi to Nepal; the Sri Lankan President to Pakistan; and the Pakistan army chief to the Maldives; are also a clear reiteration of the fact that China’s increasing influence in South Asia is beginning to shape the geo-politics of the region, and Beijing will ensure that Islamabad’s ties with neighbouring countries do not deteriorate excessively. While the key issues raised by Abbasi during his visit to Nepal were the revival of the SAARC Process (Pakistan is keen to host the next SAARC Summit in 2018 and sought Nepal’s support for the same, the summit of 2016 was cancelled, because India refused to participate post the Uri terror attacks, Bangladesh, Bhutan) and trilateral cooperation between Nepal, Pakistan and China, Abbasi also raised the Kashmir issue during his meeting with the Nepal PM. During the Sri Lankan President’s (Maithripala Sirisena’s) visit to Pakistan, the Sri Lankan leader, praised the China Pakistan Economic Corridor (CPEC) project, and also held discussions with regard to the revival of the SAARC Process. The Sri Lankan President had been invited as Chief Guest to this year’s Pakistan Republic Day celebrations. Pakistan Army Chief, General Qamar Javed Bajwa, also visited Maldives, becoming the first high-ranking foreign dignitary to visit the country after the lifting of the 45 day emergency. Bajwa was invited by Maldives National Defence Force chief Major General Ahmed Shiyam, and met with defence minister Adam Shareef Umar. The Pakistan Army Chief also spoke in favour of strengthening ties between both countries. One of the significant takeaways of the visit was the proposed joint patrolling of the exclusive economic zone, also reported in a press release from the Maldivian defence and national security ministry. 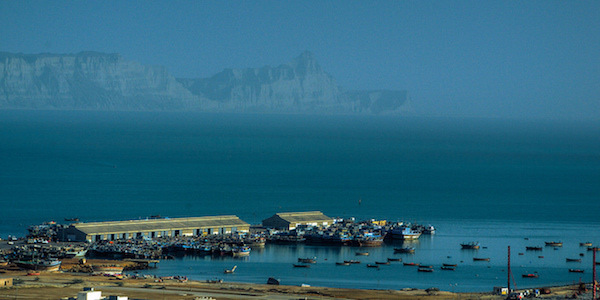 Gwadar Port, Pakistan: the port has been described as the gateway to CPEC. Photo credit: umairadeeb, CC BY 2.0. Interestingly, commemoration of the 60th year of His Holiness Dalai Lama in India was also low key, while celebrations were shifted from the capital to Dharamsala, the Foreign Secretary also sent an advisory to government officials to remain away from such events. There has also been a recent thaw between India and Pakistan: both sides have agreed to resolve issues which their diplomats have been facing through dialogue. Indian High Commissioner to Pakistan, Ajay Bisaria met with Pakistan National Security Adviser Lt-Gen (retd) Nasser Khan Janjua on April 3, 2018. Both agreed to reduce tensions, and move towards resumption of dialogue. India and Pakistan had also agreed to humanitarian measures with regard to prisoners lodged in both countries (including release of prisoners over 60). Can the triangle move away from a zero-sum approach? While a lot of attention and media space is given to the zero-sum narrative in the context of India’s ties with China and Pakistan, recent overtures by India towards China have raised some interesting possibilities. First, could China be used to pressurize Pakistan to act against terror groups?. A number of American analysts and policy makers including recently appointed National Security Advisor, John Bolton have recommended that China can be more effective in pressuring Pakistan to act against terror groups. In the longer run, New Delhi should not totally rule out triangular cooperation, if ties improve. In India, a number of individuals have even argued in favor of joining CPEC. ‘Why can’t we be partners in economic growth and share the benefits of projects like CPEC. Let us move beyond skirmishes [.] It would make the region a hub of emerging economic opportunities leading to cooperation in trade, commerce, tourism, adventure across the region’. The Turkmenistan, Afghanistan, Pakistan, India (TAPI) pipeline, in which both India and Pakistan are participating, can also be part of the CPEC project, as has been argued by some. This will off course depend upon how Pakistan and India resolve their differences over the project, but given the fact that China has proposed to extend the project to Afghanistan, this possibility cannot be ruled out. Whilst India joining CPEC may seem far-fetched currently, all three countries need to start thinking in terms of cooperation and not conflict. However, over the next few months in the run up to the elections in Pakistan, one cannot expect much in the context of India-Pakistan ties. In the meanwhile, China must also reconsider its responses to terrorism emanating from Pakistan and targeted at India. For South Asia to move beyond the current narrative of ‘competition and conflict’ innovative and forward-thinking solutions will be required but this is not impossible. This article gives the views of the author, and not the position of the South Asia @ LSE blog, nor of the London School of Economics, or CPGS, Islamabad. Please read our comments policy before posting. Tridivesh Singh Maini jee, You should know that OBOR or BRI project trillion dollar project and CPEC is one of the subset of OBOR. So India, didn’t participate because Chinese effective influence in the entire asian region. Moreover, In a diplomatic embarrassment, China has removed the remarks of its envoy in India offering to rename the China-Pakistan Economic Corridor (CPEC) from the transcript of his speech posted on the Chinese embassy website. So, kindly correct this. Thank you.